Michael Dumas-was a special teams maven for the Indiana Hoosiers blocking an impressive 9 punts over his college career. He made the transistion from cornerback to free safety but was a bit undersized at 5-11 and 178. 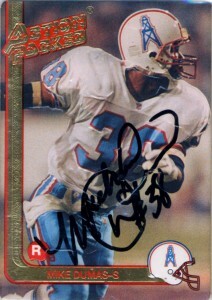 The Oilers liked to draft by the dozen, and the 1991 draft was loaded with defensive talent especially at defensive back. The Oilers would draft, Mike Dumas, Darryl Lewis, and Steve Jackson to get younger at the position. They’d take Dumas off the board first at the top of the 2nd round hoping that his big play potential and hitting would ignite the Oilers’ secondary. (Dumas initially didn’t believe that he was going to be in the NFL. He wanted to get his sports degree and be an agent.) He’d be with the Oilers for two seasons and then Buffalo in 1994 as a backup. In 1995, he’d start 8 games for the Jaguars, before finally finding a home with the Chargers in 1996 where he’d play through 2000. Dumas would sign in 2001 with the Bears, but a lingering ankle injury would end his career. Michael Dumas still longs to play the game, but the long lasting effects of his injuries have slowed him down immensely. 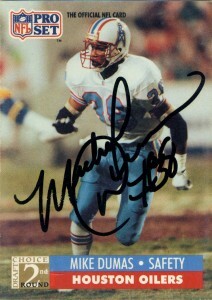 He spent some time coaching defensive backs for the Dolphins at one point and currently lives in Sunrise, Fl.